Wide diamond strips are designed for interproximal reduction (IPR) also know as tooth stripping or interdental reduction. IPR is a procedure in which part of the thickness of a tooth’d enamel is trimmed where space is needed for orthodontic realignment. The wide diamond strips, which facilitates the contouring of enamel. will also reduce many types of dental materials. It enables the often necessary reduction of the interpromoximal tooth structure, correcting inadequate space, caused by an insufficient arch length. Interproximal re-contouring is easily chieved in a minimum time with a more natural finish. 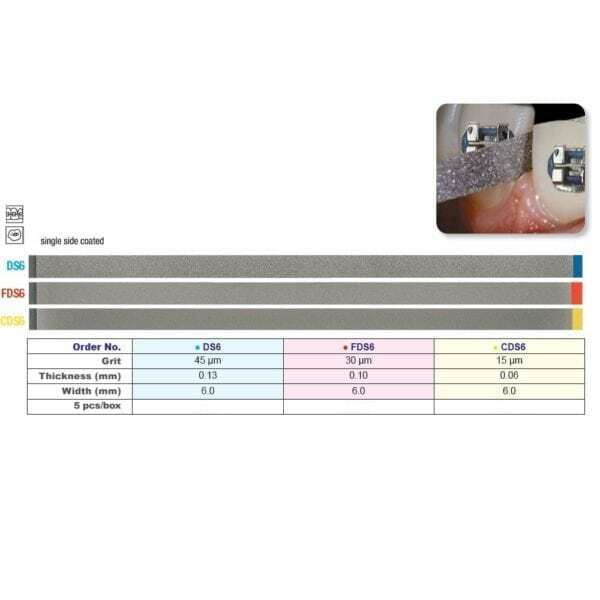 Single sided wide diamond strip are perfect for situations where you want to reduce tooth structure on one side only without any damage or marking to the adjacent tooth. Reusable, autoclavable.